ACS is a premier partner with Qwest Communications for the sales and support of DSL services. ACS Online Internet Services, together with Qwest DSL phone services, are the most economical broadband solutions for residential and small business customers. What could you do with faster Internet access? Take college courses online from the comfort of your home. Quickly find the perfect recipe for a special occasion. Easily research any topic that your family finds exciting. Trade stocks or participate in real-time auction services. Help your children excel in school projects. Find the perfect house, car or other major purchase. Watch music videos, movies, or listen to news. 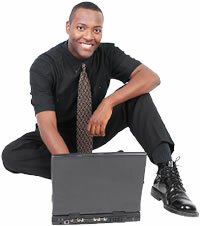 Accelerate your small business transactions. Participate in real-time video conferencing. Does not tie up your phone line while you are connected to the Internet. Allows you to be more productive and save time with dramatically faster Internet access. Easily connect multiple computers at the same time for no additional charges. No waiting for dialing. DSL is an "always-on" technology. Download security fixes and keep your computer updated in a matter of minutes. POP and WebMail email access is available. Ten (10) email accounts included with base packages. Create and host your own website for free with an unlimited number of pages, up to 10Mb. Pricing is very competitive and usually less expensive than MSN/Qwest Internet packages. Available in most areas of Colorado -- including Denver, Grand Junction, Fruita, Clifton, Palisade, Rifle, and Montrose. Very low equipment fees. DSL modems can be rented for a small monthly fee or purchased for as low as $64.99. 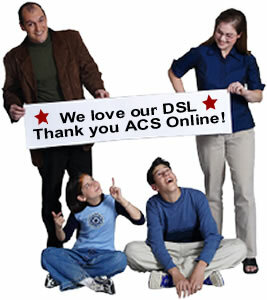 ACS broadband DSL service does not require cable TV service or cable TV connections. Advanced Spam control and Virus protection is included at no additional charge. Built-in basic firewall to help block hackers and protect your computer. No special contracts, phone services or packages are required to qualify for our pricing. The ACS Internet backbone is a "Tier One" service for fast real world performance. Our DSL equipment is a breeze to set up. ACS does not subsidize our service with pop-ups and directed marketing from 3rd party companies. No hidden fees, limited time - trial offers, or other "bait and switch" pricing. We offer honest, NO-GIMMICK services. Free technical telephone support by polite, local and certified networking staff. * Month-to-Month pricing - contract discounts available through Qwest. Please call for more information or to check pricing. **Activation fees are periodically waived or reduced by Qwest. At the time the order is placed, the activation fee will be calculated. *** Many additional types of DSL Modems and Routers are available - including wireless enabled devices. Is ACS Broadband DSL available in my area? To check DSL availability in your area, please provide us with the following information and click the Send button. We will qualify your phone line and get back to you with the results. ACS utilizes a high speed, state-of-the-art, fiber optic backbone to deliver the Internet to our customers. We have peering (interconnected) relationships with over nine (9) major backbone providers, including AT&T, Sprint, Level3, UUNet, C&W, and Qwest. This multi-path backbone provides the shortest possible route for all Internet traffic, and immediately reroutes traffic during times of congestion and upstream outages. ACS provides Internet access speeds ranging from Dialup Modem (56k) through ATM DS3 (45Mbps). To sign up or further inquire about any of our business grade services, please call one of our business services specialists at (970) 245-7088 or (888) 800-4-ACS. You are also encouraged to stop by and visit with us in person.